Our Bichon Frise, Avalanche, had not been well for months. Her incessantly wagging tail now lay motionless on the floor. I took our eleven-year-old dog to a compassionate veterinarian who diagnosed her with malignant tumors. “You’ll know when it’s time,” he said. I fought back tears while feeling an enormous lump grow in my throat. 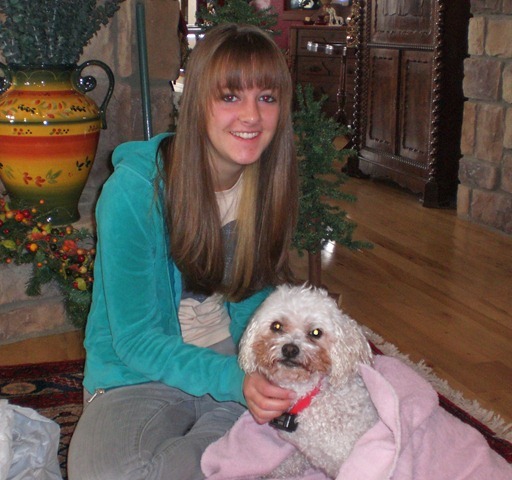 Our daughter Courtney was a junior in high school and had witnessed the sudden decline. However, our son Kelly had recently broken his back and pelvis snowboarding while being filmed on Loveland Pass. He was still adjusting to his freshman year in college where he lived in the dorms. Final exams would begin the first week of December and I worried about his reaction. I prayed Avalanche would make it through the holidays. On the drive back home I stopped at the market for some premium dog food to entice Avalanche to eat. At first she gobbled down the canned treat, but by the second week, she showed very little interest in eating. During the first week of December, we scheduled Two Men and a Truck to deliver the most amazing antique furniture I had ever seen. The massive dining room set, probably from the late 1800’s was carved with gargoyle faces and beautiful ladies. The furniture had been refinished and would arrive just in time for hosting my book club Christmas brunch the following morning. Avalanche heard the doorbell ring, but stood in the middle of the hall and stared at the front door. She usually went nuts when anyone came into the house. I discovered her in the same position after the delivery men had placed the last side board in the living room. “Maybe she’ll bounce back,” I thought. As I slowly made my way through my list of things to do before entertaining, finishing the book, The Story of Edgar Sawtelle, loomed over my head. I looked forward to reading the last chapters of this coming of age bestseller by David Wroblewski. The tale chronicled the special relationship of a mute boy and his dog while growing up with his mom and dad who are dog breeders in the Chequamegon Forest of Northern Wisconsin. That evening after my husband Danny had cleaned up the dinner dishes, I looked over at Avalanche who seemed to have trouble breathing. With tears running down my cheeks I said, “I think it’s time.” Courtney gave her one last hug and Danny drove her to the emergency veterinary clinic. While Avalanche was being euthanized, I finished the story. Have you ever read that book? 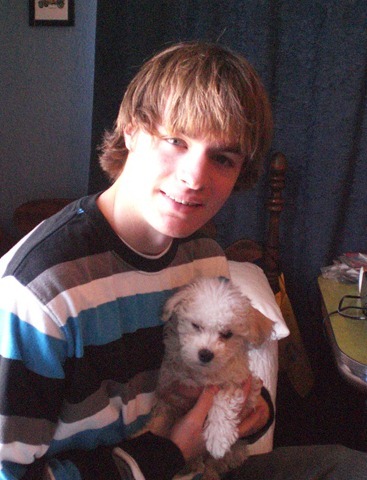 I would have been sobbing without the ironic death of our own dog! 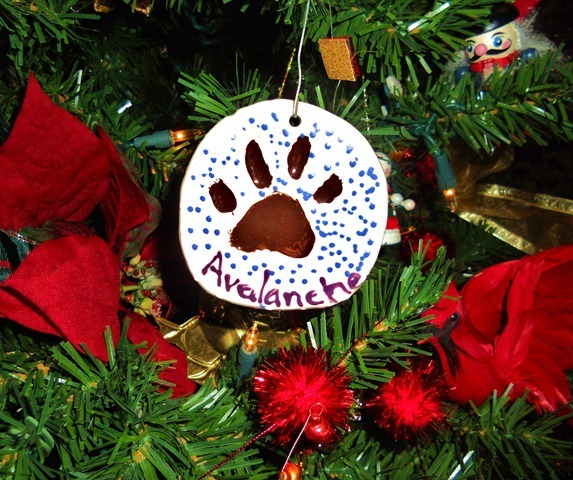 When Danny arrived back home, he handed me an ornament with Avalanche’s paw print and I hung it on the tree. Being a complete mess, I did what any mother who was distraught the night before she entertained; I went right on the computer and looked for puppies. Around midnight, I found an advertisement selling a litter in Fort Lupton. “Perfect!” I would give them a call. The next morning I raced around the house getting ready for my guests while noticing how painfully quiet it was. An hour before their arrival, I went back to the computer, but the ad had been taken down. My already broken heart crashed down into the pit of my stomach. I scanned tons of sites to no avail. Then I Googled Fort Lupton Bichon Frise puppies. There it was! I called and made an appointment for that evening. The ringing doorbell interrupted my conversation. I glanced at the kitchen clock and thought, “Oh please God no!” I took a quick look in the mirror and some unrecognizable woman with puffy red eyes and crack head hair stared back at me. I opened the front door and there were my friends standing in the snow. “Are we early?” Yes they were. By thirty minutes! I ran upstairs and whipped out the spackle and paint, put my hair in an up-do, and slipped on a Christmas outfit. As I ran back down the steps, I threw myself into hosting mode. It was a great distraction and party. After they left, I made the dreaded call to my son. “I am so sorry,” I said to the deafening silence, “but I have a surprise.” I gave him the address and he met Courtney and me at 5:00 in Fort Lupton. That’s when I did the unthinkable. I lied. They were so cute at 9 weeks old! The kids held each one and then chose the little darling with the apricot ears like Avalanche. I gave the breeder a nod and she smiled back. I jumped into the car where I had hidden the small kennel and drove out to Fort Lupton. I picked up the Christmas surprise and raced back to our party. Sneaking through the garage, I opened the basement door and tip-toed downstairs. I found a decorated Christmas box and stuffed it with the blue paper on which our new puppy had been house broken and then placed her inside. “What did you do?” said Courtney. I walked over to my two children and they lifted the lid. “Are you kidding me? It’s our puppy!” Kelly screamed. A roar went up in the room since neither my parents nor my sister had any idea. Everyone took turns holding the precious little girl while her tail wagged back and forth. It was the best Christmas ever! They did eventually ask me if I bought any Old Fashioned mix. I don’t think there was any in the entire state that year. For another Christmas story press HERE! Such a great story…, it made my eyes teary. I wouldn’t know what to do if ‘the time’ came for any of my beloved kitties. I would probably mourn for days. Thanks for reading! It was a tough time especially since about 3 weeks passed before we got our new puppy. Even then, I still missed our Avalanche for months afterward! This one made me tear up! What a Christmas, thanks for sharing. My dog turned 11 this year and I’m going to miss her terribly when its time but until then, we’ll soak up the moments. Great posting. And thanks for visiting my blog!